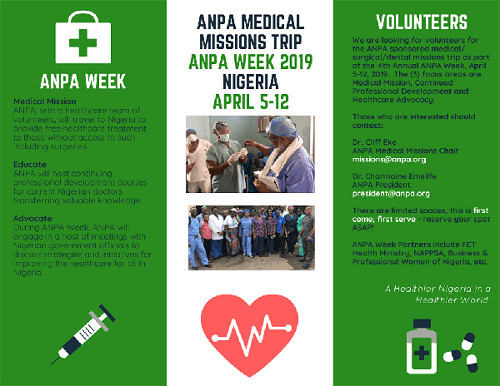 The Association of Nigerian Physicians in the Americas (ANPA) and The Nigerian Association of Pharmacists and Pharmaceutical Scientists in the Americas (NAPPSA) are organising a medical mission trip to Nigeria on 5 to 12 of April 2019. 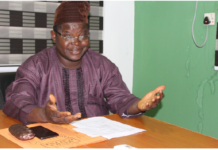 This medical mission is focused on the provision of necessary patient care interventions in a clinic setting, provision of surgical interventions, Dental and Pharmaceutical care, continuing professional development and training to locally based healthcare providers and strategic interactions with Nigerian healthcare stakeholders, to foster overall healthcare improvement opportunities in all the various facets of healthcare delivery in Nigeria. While soliciting for the support of stakeholders, to enhance the provision of medical and pharmaceutical aids to the severely underserved communities in Nigeria, ANPA/NAPPSA Medical Mission Team Coordinator, Dr Teresa Pounds, emphasised the essence of the mission, noting that it is for the joint achievement of ANPA and NAPPSA vision of a healthier Nigeria in a healthier world through information exchange, educational development, professional collaboration and cooperation. 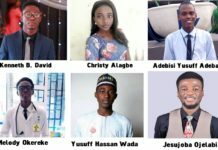 Dr Pounds, who spoke through a statement sent to Pharmanewsonline.com, said the medical mission trip is funded largely by donations used exclusively for the benefit of Nigerians. “Our goal is to promote long term self-sustaining healthy communities through medical missions. We typically cover travel expenses for all the professional volunteers who are responsible for all patient care activities, we also have a drug formulary, medical, dental and pharmaceutical supplies list needed to effectively provide patient care activities. “All materials donated for the mission will be left in Nigeria to be used for the continued care of Nigerians. It is therefore critically essential that you please partner with us to make this medical mission a success through your tax-deductible financial contribution or the donation of items in the attached list”, she pleaded. Anesthesia, surgical supplies, tools and medications. Diabetes medications, monitoring tools and supplies. Heart and blood pressure medications, Diagnostic & monitoring tools and supplies. Medical supplies and diagnostic tools.